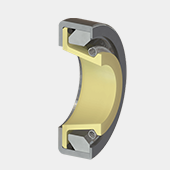 Rotary Lip Seals - Eclipse Engineering, Inc.
Rotary applications involve a very specific set of requirements that must be addressed in order to ensure a proper seal. 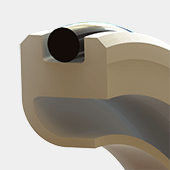 Foremost of these concerns is the ability of the seal to stay stationary in the gland, resisting the rotational forces created from the seal /shaft interface. For this reason, rotary lip seals always employ some sort of anti-rotation feature. This can be in the form of a metal case that gets press-fit at installation, or as an O-Ring that applies gripping friction to the bore. Another consideration in rotary service involves the issue of heat build-up due to friction. In order to make a positive seal, the seal lip must contact the shaft in some fashion. This contact creates friction, which can generate enough heat at high pressures and speeds, that both the seal and the hardware become compromised. Eclipse PTFE based ͞ET materials are utilized for rotary lip seals providing an optimized solution that offers low-friction and long seal life. For this configuration, anti-rotation is achieved by using an O-Ring to create a frictional interface between the seal and bore. Although a metal cased lip seal has higher pressure and speed rating, an O-Ring OD lip seal is a good choice economically when application parameters permit. Lower use applications such as food processing equipment, pharmaceutical equipment and environmental shaft excluders can benefit from this design. For friction sensitive applications, a lip seal with O-Ring OD should be considered. In service, a lip seal will experience a short period of break-in, after which time the seal element will reach a steady state condition. This steady condition allows very low, very consistent friction equating to low power consumption and heat generation. The MicroLip is a special class of rotary lip seal, manufactured exclusively by Eclipse Engineering. It takes the industry accepted features of a metal case and spring loaded lip, but is unique in manufacturing process. By utilizing high-speed turning centers, components are precision machined allowing for quick turns on prototypes and small runs as well as allowing design flexibility to fit into reduced hardware cross-sections. 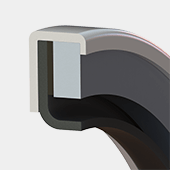 Manufactured with Eclipse ET sealing materials, the MicroLip offers the highest PV rated seal possible in the smallest design cavity.